If you plan to live in Ecuador you will eventually ask yourself the question about using mail service in Ecuador. How do you get purchases made online to your home in Ecuador? A simple service we take for granted in modern developed countries. Mail Service in Ecuador is unreliable and slow. Customs also can provide problems slowing down delivery and charging heavy import taxes on goods entering Ecuador. In Ecuador there are no mail boxes for houses and many towns don’t have a post office. How do you get packages and mail then? A service called Club Correos comes to the rescue offered by the Ecuadorian Postal Service. Check if your city or the city closest to you has a post office. Bigger cities such as Manta, Cuenca, Quito and Guayaquil will have them so be sure to check. Using Club Correos is simple it is like using a UPS Store. You are basically renting a P.O. box. Club Correos charges a $10.00 yearly fee. You are given a physical address in Miami where you will ship your online purchases or items you want sent to. From here the service sends the package to the city of choice in Ecuador. Club Correos takes care of all the importing and customs details so you never need to worry about this. When the package arrives in Ecuador the Ecuadorian Post Office will give you a call to let you know you have a package that needs to be picked up. It is possible that they will actually deliver the package if you can tell them how to get to your house. Keep in mind that it is likely easier that you pick up the item yourself. · Packages from Miami to Ecuador must not weigh more than 4 kg. · The package must not have a value over $400.00. · Shipping costs about $5.00 for each pound of weight. 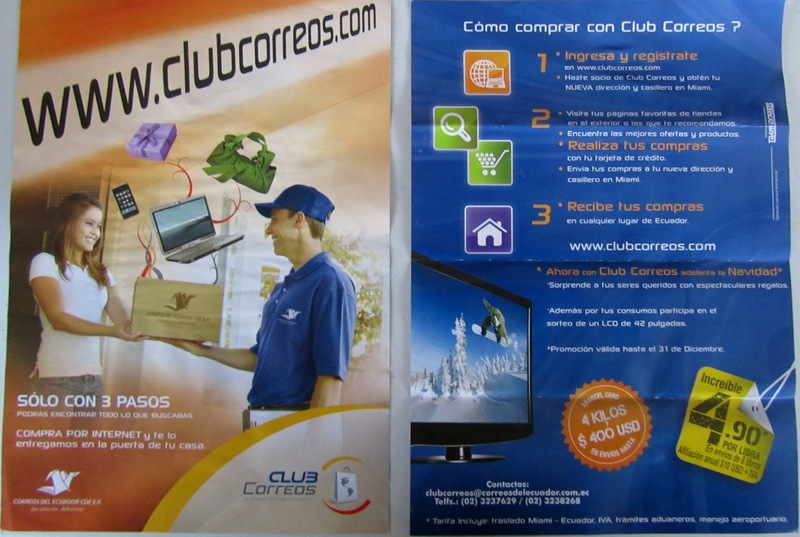 · Club Correos bills your credit card on file for the shipping charges. The service is relatively quick and you should receive your package in a couple of weeks. The service that Club Correos offers is the most efficient and hassle free way to obtain online purchases mailed from the United States. If you live in Canada this service should work as well for you. If you live in Ecuador and are using this service from ClubCorreos, I would love to hear from you. Does ecuadorian customs or post office open the package to examine contents. I want to send flower seeds from usa to here but not sure if prohibited and root beer extract and not sure if this qualifies as drinK and special concentrated grape juice capsules and not sure if this qualifies as medicine. Any advice would be welcome before I make my order. It is very likely that customs will open your package. It happens more often than not. I would recommend that you send it because it seems so random on what they pass and do not. It seems to depend on the customs officer doing the inspections. Give it a try and see what happens. You can also check with U.S. customs to see what they say…Good luck and let me know how it turns out.